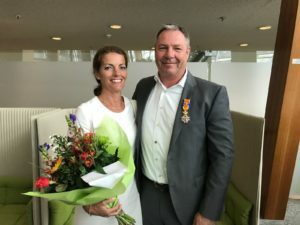 Menzo Havenga: Officer in the Order of Oranje-Nassau! We are very proud that our CEO, Menzo Havenga, has been decorated in the Order of Orange-Nassau for his scientific achievements and his contributions to society. The Order of Orange-Nassau is a civil and military Dutch Royal order of chivalry founded on April 4, 1892. Menzo received the decorations that come with this distinction from Liesbeth Spies, the mayor of Alphen aan den Rijn. The more than 120 peer-reviewed international scientific publications that Menzo (co-) authored as well as his significant patent track record in the field of vaccine technology are both clear testimonials to his scientific contributions to the field. In addition, his entrepreneurship, exemplified by the founding and building of Batavia Biosciences company group, has allowed Menzo to promote collaboration between government, academia, charity and the industry and to accelerate the transition of potentially lifesaving medicines from bench to clinic. The management and staff of Batavia Biosciences herewith congratulate Menzo Havenga with this special Royal distinction.